2 for 1! Companion cruises for free on Europe river cruises. Click here for eligible departures. Save an additional $1,000 per couple off this cruise. This offer is combinable with most promotions. Expires April 30. Click here for eligible departures. Receive a $400 per couple onboard credit on this sailing. This offer is combinable with select promotions. Click here for eligible departures. Early payment discount! Save an additional $300 per couple when you book and pay in full 180 days before departure. Click here for eligible departures. On the three-border intersection of Switzerland, Germany and France and unfolding in two sections from the banks of the Rhine, Basel has an international flair, a cultural vibrancy and is picturesque besides. A medieval town center invites exploration by foot, while an abundance of museums and galleries suggest an indoor stroll amid works of art and relics of history. The Museum of Fine Arts is home to the world’s oldest art collection accessible to the public. The city itself hosts Switzerland’s oldest university, dating to 1460. Antiquity may be Basel’s strong suit, as it is in much of Europe, but this corner of Switzerland also reveals a more modern countenance: Architects Herzog & de Meuron, best known for the design of the Tate Modern in London and the Bird’s Nest in Beijing, and Frank Gehry of Bilbao Guggenheim Museum fame have contributed their considerable talents to buildings here. Overnight in Basel on Day 1; depart Basel the morning of Day 2. Situated along the Rhine about halfway between the supremely scenic towns of Freiburg and Colmar, Breisach is the perfect place from which to launch explorations into the surrounding Black Forest. Yet there is much to keep travelers within the embrace of this lively city, including its Romanesque church with late-Gothic altar and cobbled streets lined by pastel-hued buildings. Just a few miles west of Breisach is the remarkable star-shaped fortress town of Neuf-Brisach, or New Breisach, a UNESCO World Heritage Site. Overnight in Breisach. When you glimpse the steep-peaked, half-timbered buildings, the place waters of narrow canals, flowers blooming on balconies and bridges, and old towers standing sentry over the scene, you know you have stepped into Strasbourg – either that, or the very pretty pages of a fairytale. The capital of the Alsace region and seat of the European Parliament, Strasbourg is simply one of the most photogenic old towns in existence. It boasts a breathtakingly gorgeous Gothic cathedral (with the tallest cathedral tower in France), twisting alleyways, a sweet collection of the aforementioned half-timbered buildings and a charm that oozes from virtually every cozy corner of Grande Île, or “Large Island,” the first city center to be named a UNESCO World Heritage Site. In 1885, “driving a Benz” meant operating a three-wheeled, open-air carriage glorified by the world’s first purpose-built, rear-mounted internal combustion engine – the brainchild of Karl Benz, innovator and engineer extraordinaire. The name Benz is still synonymous with automotive innovation, of course, and the city of Mannheim is where this legacy began. It is still home to Daimler, the automotive giant with whom Mercedes-Benz eventually merged. Also born in Mannheim was the “man-powered running machine” (better known as a bicycle), the Lanz Bulldog tractor and first rocket-powered aircraft, firmly establishing Mannheim as the place for innovation and industry. Mannheim is actually the place for many things. A university town on the banks of the Rhine and Neckar, Mannheim is alive with hubs of diverse food, drink and shopping, as well as a thriving art and musical culture. During the holidays, the Rüdesheim Christmas Market takes center stage. Try some deliciously made Rüdesheim Coffee, locally made with Asbach Uralt Brandy and whipped cream, exclusively offered during the season. With more that 100 kiosks and stalls offering local wares and seasonal gifts, there is much to see at this annual event—from local Rüdesheim coffee to global flavors like Finnish specialties and even Mongolian food fare. Located where the Rhine and Moselle rivers and three low mountain ranges meet, Koblenz has a leg up in the scenery department. Add to that the city’s 2,000-year-old history, hilltop fortress and squares lined by classic Germanic architecture and you have a place ready made for photographs. You might start by aiming your lens at the Deutsches Eck, or German Corner, where the rivers merge around a corner of land marked by a monument to Emperor William I. Ambling along the river promenade and exploring the town’s narrow lanes, you might encounter medieval churches, flower-filled parks, sidewalk cafes and perhaps a weinstube, or wine tavern, an ideal venue for sipping dry Riesling and drinking in the atmosphere. Overnight in Koblenz. For a city whose history can be traced to the 7th and 8th centuries, Düsseldorf's contemporary architecture, edgy art culture and innovative business landscape is all the more impressive. The capital city of the North Rhine-Westphalia is decidedly posh, pushing the boundaries of high fashion and high-rise design, and a culinary and nightlife scene that caters to the international elite who populate the city. Indeed, banking and cutting-edge technology industries have brought the city great wealth, while its flair for the creative and collective passion for celebrations of all kinds take some of that serious edge off the atmosphere, making Dusseldorf one of the world’s most livable cities. In the Altstadt, the historical quarter along the Rhine, look for an intriguing blend of time-honored sites and traditions and a lively modern neighborhood filled with energetic bars and restaurants. People have been fighting over Arnhem for centuries. It’s no mystery, given its natural beauty, abundant parks and bicycle pathways, and lively scene of cafes and creative hubs. Perhaps Arnhem’s most famous – and darkest – occupation came during World War II, when the Nazi German 10th Army invaded the Netherlands, occupying the whole country within one week. In resistance, Arnhem became the site of the largest airborne military operation in history, Operation Market-Garden, deploying more than 35,000 paratroopers over the bridges and occupied land. Today, if you look skyward, you’re more likely to see vast canopies of treetops than parachuting soldiers, though the event is commemorated at the nearby Airborne Museum, boasting an impressive collection of photography, weaponry, documents and other accounts of the conflict. Everyone has an image of Amsterdam. For some, it’s small boats gliding on the canals and locals two-wheeling on bikes to and from work and, as frequently, to meet friends for drinks. For others, it’s gabled buildings leaning, seemingly precariously, over cobbled streets and cozy taverns illuminated by candles. Still others imagine tulips in bloom and the colors, both muted and vibrant, of the paintings Vermeer, Van Gogh and Rembrandt. All images are true and even more beguiling when experienced in person. Sit a spell in a convivial cafe, explore world-class museums and feel the significance of a unique history—one of a city reclaimed from the sea, rising in prestige and influence as merchants built trade and wealth, and forever known for its attics and attitudes that offered refuge from war. Narrow streets and great manses tell the story not only in images but with the aroma of appeltaart, a taste of the avant garde in newly constructed buildings and a feeling of warmth from the amiable locals. Overnight in Amsterdam. Overnight in Amsterdam on Day 11; disembark in the morning of Day 12. 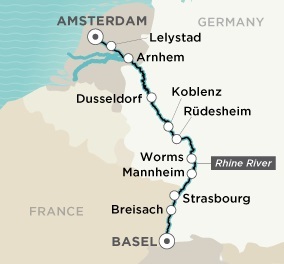 Experience the holidays on a fairytale voyage along the enchanting Rhine River. Strasbourg’s gothic architecture, Mannheim’s thriving art scene and Basel’s picturesque Old Town enchant on a journey designed to ring in the New Year in style. Port charges of $275 per person are not included in the pricing above.